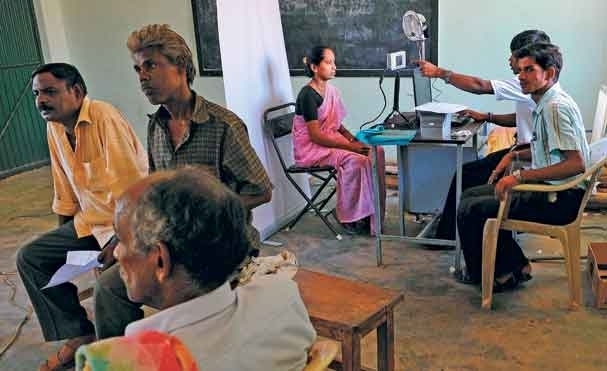 A section of residents of Little Kancheepuram have objected to the dress code that is insisted on while their pictures are taken for the issue of Aadhar Card. They refused to wear shirts or T-shirts with collars that are the prescribed dress code. “We prefer to be photographed in our traditional wear, with an angavasthram,” said V. Narayanan of Sri Rangaraja Veethi. Residents such as Mr. Narayanan and R. Srivatsan of Vegavathi Street were sent back without their data being captured at the camp held at a school on South Mada Street for the simple reason that they did not wear a shirt. In the camp, data including passport-size photographs, eye balls and finger prints of citizens were recorded. When residents sought an explanation for the insistence on a dress code, the staff members at the camp who were taking the photos, said that they were merely sub-contractors and had been directed to capture the images of residents only if men and boys wore shirts with collars and girls sported duppatas. Mr. Narayanan, exhibited a card issued to him last year by the Union Government, wherein his image with an angavasthram around his shoulders had been printed. “I was told that the card issued to me last year will no longer be valid, which is why I came here. But now when I came here to comply with the government’s direction to avail this new card, they insisted that I wear a shirt”, he said. M.R.V. Krishna Rao Joint Director, Census Department, told The Hindu that several such objections to dress code to had been recorded by the various vendors involved in capturing data. “In one place, members of a tribal community objected to wearing shirts. We can only ask them to wear a shawl. In another case, a woman had to be sent back as she had come in a T-shirt,” he said. The department has asked the vendors to take photographs without hurting sentiments. “We held a meeting on Thursday and we have asked them to take photos as per individual requests. If the Unique Identification Authority of India rejects their cards on the basis of the photographs, then we will inform the public and take photos in the second round,” Mr. Rao said, adding that his office will soon write to the Authority informing of the objections to the dress code.